TMNet WebConfig is a Web application to set up the basic functions at a TM-Intelligent printer. 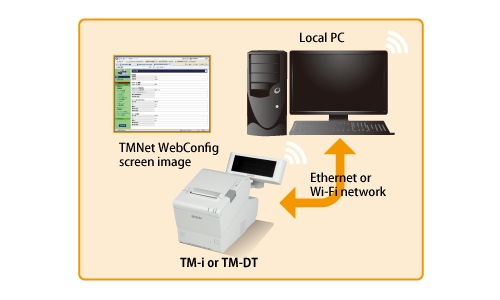 It is initially installed on a TM-Intelligent printer so you can access the application using a browser application on a local PC that is connected to a TM-Intelligent printer through the Ethernet or Wi-Fi network. The setting data by TMNet WebConfig is stored in a local PC. So you can utilize the stored setting data to set up another TM-Intelligent printer. Or you can transfer the setting data to another TM-Intelligent printer using the Easy Setup function through a USB memory device. TMNet WebConfig has APIs that can be accessed from a web application. Using TMNet WebConfig API, you can change the TM-i setting in your application. For more details, please refer to the "TMNet WebConfig API users manual", which can be downloaded at the Download page. [Note] *: TMNet WebConfig API is available for TM-i only.